Request 1 or more metal choice here. 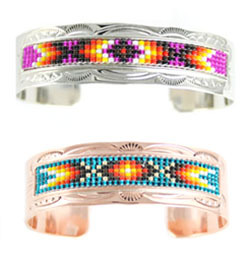 Navajo crafted approximately 3/4" wide stamped bracelet that has a strip of bead work down the center on either copper or nickle silver. The beaded area is about 3/8" wide. The color and pattern of bead work will vary. Navajo crafted by Geraldrita Whitehorne. Choose metal when ordering.